Crime thriller “Asura: The City of Madness” will soon be shown on screens across North America. Since its screening at the Toronto International Film Festival last month, the film has caught the attention of the global cinema industry. It made its US debut in Los Angeles on Oct. 7 and will open in 30 major cities in North America, including New York, Chicago, Toronto, Houston and Washington D.C. on Oct. 14, according to CJ Entertainment. Currently preparing for its Asia rollout, “Asura” will also make its debut in Australia and New Zealand on Oct. 13. Directed by filmmaker Kim Sung-soo -- best known for “The Ultimate Warrior” (2000) and “Beat” (1997) -- the blockbuster broke the record for best-selling R-rated movie on the first day of its local release. 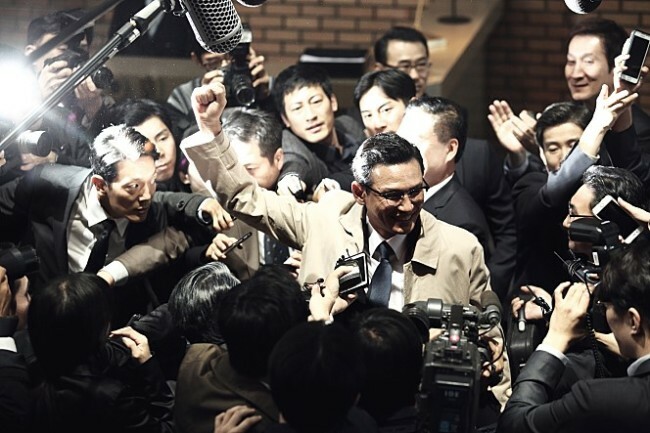 The crime noir, starring actors Hwang Jung-min, Jung Woo-sung and Kwak Do-won, depicts the corrupt -- and oftentimes gruesome -- realities of greed-driven modern-day politics.